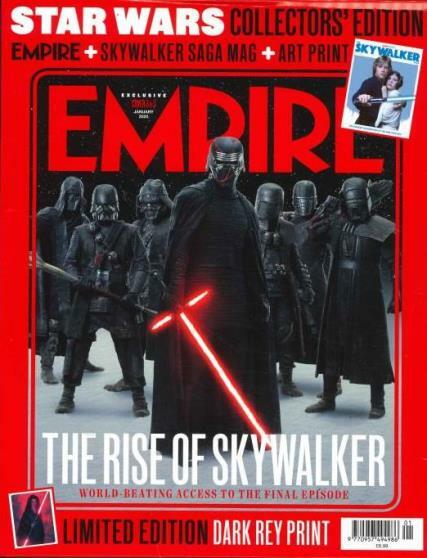 Empire magazine is the biggest selling, most respected film magazine on the planet. Buy a single copy or subscription to Empire magazine. Bringing you the best in cinema and DVD every month, razzing your retinas with stunning photo shoots and exclusive pictures, bringing you interviews with the biggest star names from the hottest locations. Great mag...my wife loves it! Everything a film geek will need. It's consitently witty, interesting and crammed full of all sorts of tasty information. It's the only magazine I buy.I like it. I like it alot. I love it and have read it from issue 1. I love all the latest movie news and always has the latest exclusives on all the best films. When I want to go to the cinema I always look at my latest issue of Empire and check out the film review before I decide what I am going to see. Empire has the best pictures, exclusives, reviews, competitions, movie news, gossip and all the info you need on the latest blockbusters. You can even plan your summer ahead with their previews I fill my diary with movie release dates.